I had a lot of fun making this one!! Thank you to Kathy for giving me the opportunity to guest design for Peachy Keen. I got to play with these awesome Cottage Cutz dies paired with face stamp sets. This card turned out so so so cute! Instructions are below the pictures. 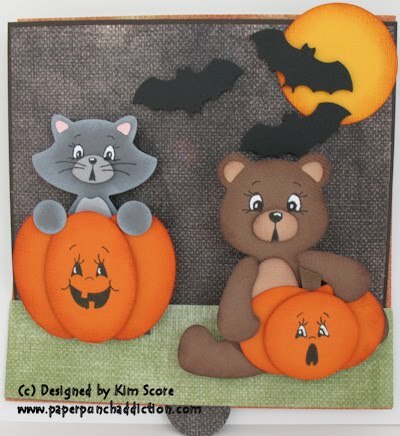 2 1/4" x 1 1/2" early espresso cardstock (pop up backing for cat) - scored at 1/2"
2 3/4" x 1 1/2" early espresso cardstock (pop up backing for bear) - scored at 1"
Large pumpkin is made of 3 Wide Ovals and small pumpkin is made of 3 of the 1 3/8" Circles punched out of pumpkin pie cardstock. Sponge the edges of all pieces with cajun craze (or really rust) ink. Stamp the faces using the Peachy Keen pumpkin face stamps. Glue 2 pieces together for back of each pumpkin and attach stamped piece to front with dimensional. For small pumpkin, hand cut a stem out of chocolate chip cardstock and glue to top. Punch the 1 3/4" Circle in summer sun cardstock for the moon. Sponge the edges with cajun craze ink. Punch out 3 black bats. Glue moon onto back piece and attach bats with dimensionals. Die cut the Tear Kitty in basic gray and going gray cardstock (pink pirouette for ears). Stamp the face of choice on the face. Stamp the face again on muzzle die piece (mouth, nose and part of the whiskers). The die comes with 3 different PKS face stamps. Line up the muzzle piece over the stamped face and attach with a dimensional. Add whites to the eyes with a uni-ball white gel pen. Punch out 2 of the 1/2" Circles for paws. Sponge edges of cardstock with white craft ink. Attach belly piece with dimensional. Glue on pink ear pieces. Attach paws to large pumpkin with dimensionals. Glue kitty onto back of pumpkin. 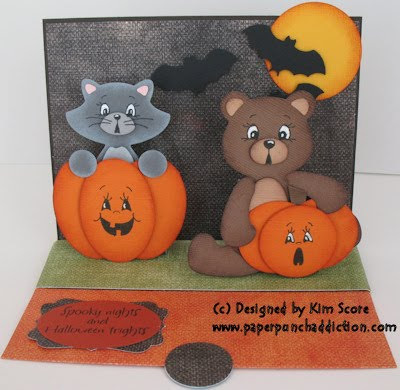 Die cut the Tear Bear in close to cocoa & creamy caramel cardstock. Stamp the face of choice on the face. Stamp the face again on muzzle die piece (mouth and nose). The die comes with 3 different PKS face stamps. Sponge edges of all pieces with chocolate chip ink. Line up the muzzle piece over the stamped face and attach with a dimensional. Add whites to the eyes with a uni-ball white gel pen. Attach belly piece with dimensional. Glue on ear pieces. Glue legs onto bottom of body. Attach small pumpkin to front of bear with dimensionals. Attach left arm with dimensional. Glue right arm on. Stamp greeting (Rubbernecker) with early espresso ink onto cajun craze cardstock. Punch out with wide oval punch and layer onto decorative label punch (black print paper). I really hope you get a chance to try out the Cottage Cutz dies with stamps. These are awesome for paper piecing. I used my Sizzix Big Shot to cut with the dies. I found that it wasn't necessary to attach the thin foam backing to the die since the die cut perfectly with the platform and all tabs closed, sandwiched between the 2 clear cutting plates. If you use a different die cutter, you may find that the foam backing is necessary to get a good cut, you can experiment with both, since the foam backing will peel off if you don't need it. I hope you all enjoy this project as much as I did! Your card is cute as can be!!! Oh my goodness, this is the cutest card. TFS. I love this adorable card!!! Wow, these are great and a fantastic place ot use my new peachy keen stamps... you're great! Tks for sharing I truly enjoy your blog! This is so awesome!!! I love it! I don't have the die for that kitty, but I might just try to make one from my SU! punches. Thanks for the inspiration! Hello, Kim! OMG! It's my first time here in your blog and I'm having so much fun! Your Punch Art are spectacular :) Thank you so much for finding me and leaving a comment in my blog too! Will visit you again :)TFS!!! Oh man, this card is toooo cute! I love it! Thanks so much for sharing it! love it!!! you're so talented with punches!! What a cute card, I've just discovered your blog & have now bookmarked it so I can come back & explore when I have time. Thank You! !